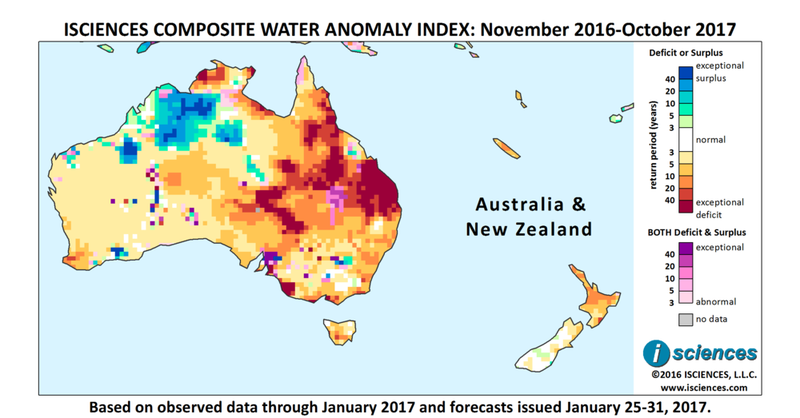 The 12-month composite map (below) indicates severe to exceptional water deficits in Australia’s eastern half, and surpluses in the northern part of the western half. Moderate to severe deficits are forecast for southern Tasmania; North Island, New Zealand; and New Caledonia. Eastern Australia's recent record-breaking heatwave combined with already dry conditions raised fire conditions to catastrophic. "They are labeled catastrophic for a reason, they are rare, they are infrequent, and to put it simply, they are off the old conventional scale," stated the Rural Fire Service Commissioner for New South Wales as more than 2,500 firefighters battled 80 fires in the state. At least 19 homes were destroyed along with machinery and livestock. A statewide fire ban was in place and national parks closed. In January a bushfire devasted 900 hectares of national park along the Sunshine Coast in Queensland. Sydney Airport recorded its hottest February day with 42.9C (109F) and a statewide NSW average temperature of 44C (111F) set a new February record, while temperatures above 47C (116.6F) were recorded across some parts of the state. Residents of Sydney sought shelter in air-conditioned shopping malls. The Australian Energy Market Operator ordered 100MW of load-shedding that affected 40,000 people in Adelaide, South Australia. Thousands of bats dropped dead from the heat in northern New South Wales. Drought was declared in Northland, New Zealand, enabling farmers to qualify for tax relief and rural assistance payments. With no significant rainfall since October, dairy farmers are facing a 20 percent cut in production. 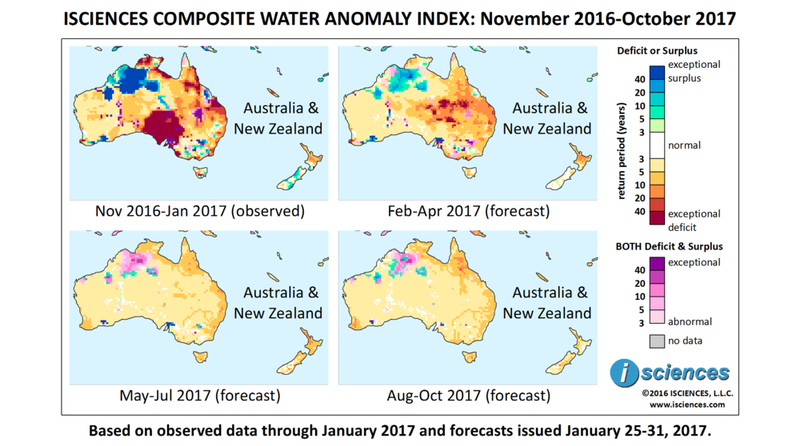 The maps for the first six months – observed conditions through January and forecast conditions through April – indicate widespread water anomalies in the region, both deficits and surpluses. In contrast, the extent and severity of anomalies is expected to diminish considerably in the latter six months. From February through April moderate to extreme deficits are forecast for much of Queensland along with pockets of exceptional deficits in Channel Country and Central West. Primarily moderate deficits are forecast for much of New South Wales and for southern Victoria. Moderate to severe deficits are expected to persist in North Island, New Zealand. Prior exceptional surpluses observed in the northern part of Western Australia and into the Victoria River Basin of Northern Territory are forecast to persist but will diminish in severity. The forecast for May through July looks less eventful. Moderate deficits are forecast in Northern Territory’s Top End; around the southern shore of the Gulf of Carpentaria; Cape York Peninsula, Queensland; and along the Great Dividing Range in the east down through New South Wales. Moderate to severe deficits are expected to persist on North Island, New Zealand. The final months – August through October – indicate a forecast similar to the prior three months.